Opening Reception with the artists: March 1, 6 - 8 p.m.
Every Friday for twenty-four weeks Amy Herman and I sent each other a photograph in response to an earlier exchanged image. <REPLY> presents these photographs and the non-linear visual conversation that formed. Each image has two authors and could not exist without those made before. This is a collaborative exhibition of forty brand new photographs and we're excited to present this project publicly for the first time. Check out the Facebook event and let us know that you'll be there! selected photographs from can i have more time, 2018.
selected photographs from and then you left, 2018. If you find yourself driving through Hendersonville, North Carolina this summer, please swing by Crate Project. It is a lovely contemporary art gallery nestled next to a wine store - a perfect alternative art space that supports research-based artists. I'm thrilled to have a selection of Dangerous Waters prints on view through July 14. The closing reception will be the afternoon of July 14 and I'll be in attendance to give a brief talk and sign some books. My most recent exhibition, Dangerous Waters, was held in Charlotte, North Carolina, at C3 Lab. The exhibition included 40 photographs from the book. 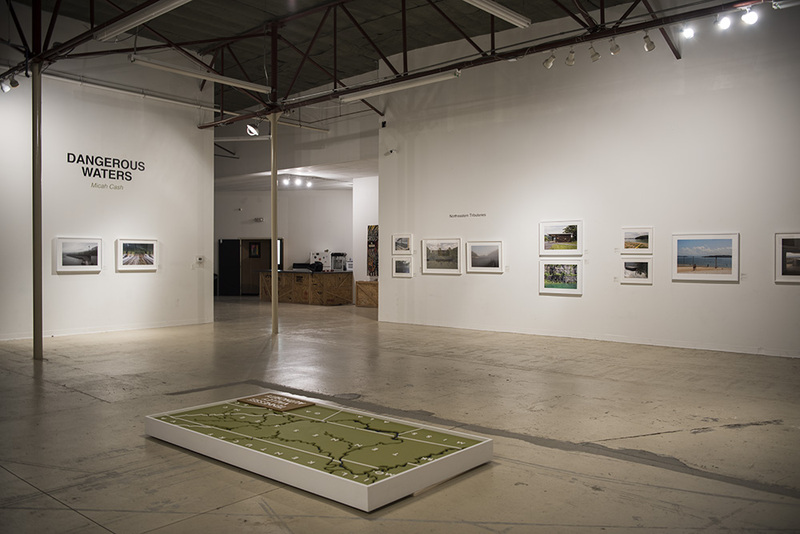 The photographs, all signed and editioned, were installed in sequence and grouped according to the four sections of project: Northeastern Tributaries, Southeastern Tributaries, Central and Western Reservations, and the Tennessee River. The installation included a wooden map made by furniture designer and woodworker Jeffrey Barninger and an eight foot Dangerous Waters sign created by Barninger and ACSM's Glen Nocik. This exhibition is ready to travel and will be installed again in June 2018 at Crate Project in Hendersonville, NC. Dangerous Waters, C3 Lab (Charlotte, NC). December 2017. I'm honored to be a participant in this year's Smash & Grab at Locust Projects. I am a fan of Locust Projects' commitment to experimentation without the weight of commercial viability or desire. It is an incubator for risk-taking and conceptual thinking. If you're interested, you can take home the lovely painting, Prevents Passage. I made this painting in the spring of 2017 as part of my Spatial Change/Social Equity series. You can see it prior to shipping below. Find out more about Smash & Grab HERE.